Addiction is an issue that touches many lives, and has been explored from different perspectives in the arts and media. Even those who have had no personal experience with addiction, whether their own or that of a family member or friend, are familiar with the concepts of rehab and twelve-step programs. In Duncan Macmillan’s play People, Places and Things, the focus is on an actor, Nina/Emma/Sarah/Lucy, portrayed with sensitivity by Meggie Azarzer, and her experiences in trying to get clean. 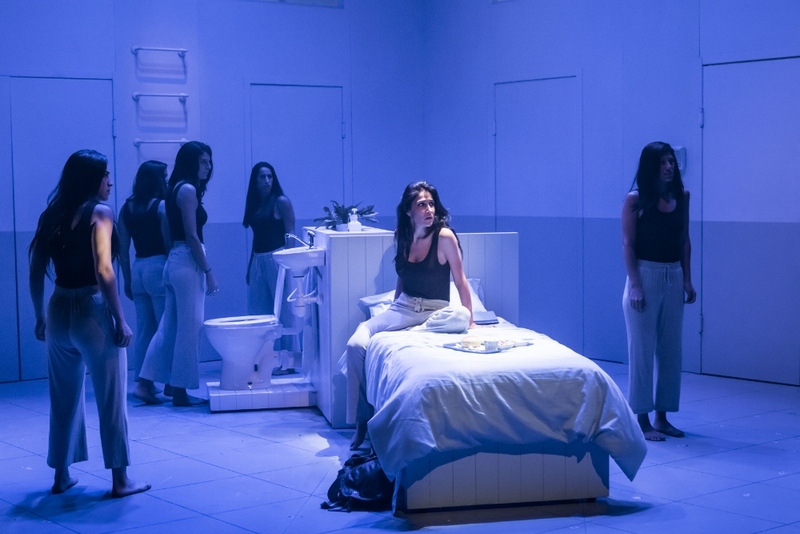 Yet thematically the play reaches beyond the 28 days, and Director Roni Pinkovitch takes an intelligent, well-crafted and very moving look at addiction that also invites reflection on issues of identity. The question of identity and role-playing is present from the first. The play opens on Nina (Azarzer) and Constantine (Nimrod Bergman) in mid-conversation, and anyone familiar with theatre will recognize the scene from Chekhov, as Nina says: “I’m a seagull…no, that’s not it, I’m an actress.” Nina’s speech in The Seagull reflects the turbulence of her emotions, it is the testimony of one who has survived hardship, sees her mistakes and failings with clarity and can summon the strength to go on. Yet suddenly this Nina says she’s tired, and begins to take off her dress, then collapses. The scene dissolves into the pulsing rhythms of a club, bodies dancing under the glowing lights, seduction deftly choreographed as hands reach out to her with their offering of a temporary balm for existential pain. Pinkovitch, and the excellent creative team, create stylized, ritualized scenes depicting significant moments for the protagonist: the club scene, checking in to rehab, detox. Distancing the events from a naturalistic description of reality avoids clichés of addiction stories, and takes these moments into a more symbolic realm. The significance of Nina/Emma/Sarah/Lucy’s profession has many aspects. Perhaps the most accessible is a reflection on the difficulties of acting as a career with its uncertainty, the extreme highs and lows, the burden of dealing with rejection, the long hours and constant competition. Not to mention the difficulty of entering into different characters and balancing a personal life with this chameleon-like professional life. The tendency towards substance dependency is clear. It is as an actor, albeit incognito, that she checks into rehab. She needs a clean bill of health so that she can work again, and she takes on rehab as yet another role, even checking in under the name of Chekhov’s character, Nina. Meggie Azarzer is a clever and charming Nina/Emma/Sarah/Lucy, at once enchanting the viewer, yet at the same time exuding a vulnerability that makes one question – why is she working so hard to be clever all the time? Azarzer’s performance elicits empathy for the character’s harrowing journey, it’s resonant and affecting. Yet my one caveat is the character’s nervous habit of twisting her hair; although at first it provides insight to Nina/Emma/Sarah/Lucy’s emotional state, eventually it becomes a distraction. The play’s ensemble cast is excellent, many of them taking on several roles. Naama Shapira stands out for her ability to immerse herself in a character, embodying the role fully. As the Doctor she is unswervingly direct and stern, as Lydia the group therapy leader she is soft, melting into smiles and empathy, and as Mum, she is at once heartbreaking and terrifying. The trope of acting reverberates throughout the play, interwoven with the concept of therapeutic role-playing. It’s no wonder that Nina is everyone’s first choice as a partner in these exercises. Taking on a persona is one way to deal with a difficult situation, raw honesty is another; the play illuminates both. Chekhov’s The Seagull provides a powerful image for Nina/Emma/Sarah/Lucy’s conflicts. The seagull is an innocent, a victim sacrificed on someone else’s whim; to be an actor is a choice, a declaration of individual agency. The play, with its open-ended structure, raises questions: Am I the victim of circumstance, the product of my DNA, upbringing, environment? Or am I an individual with agency who can make choices and decisions? Yet this questioning of identity – in some scenes embodied literally with several Nina/Emma/Sarah/Lucy figures onstage – its unity, continuity, and origins, extends beyond the theatre, to become a more general, wider, exploration of self, individuation, and choice. In twelve-step programs and other structures of rehabilitation one is alerted to be aware of the triggers – people, places, and things – that may lead one to return to destructive behaviors. 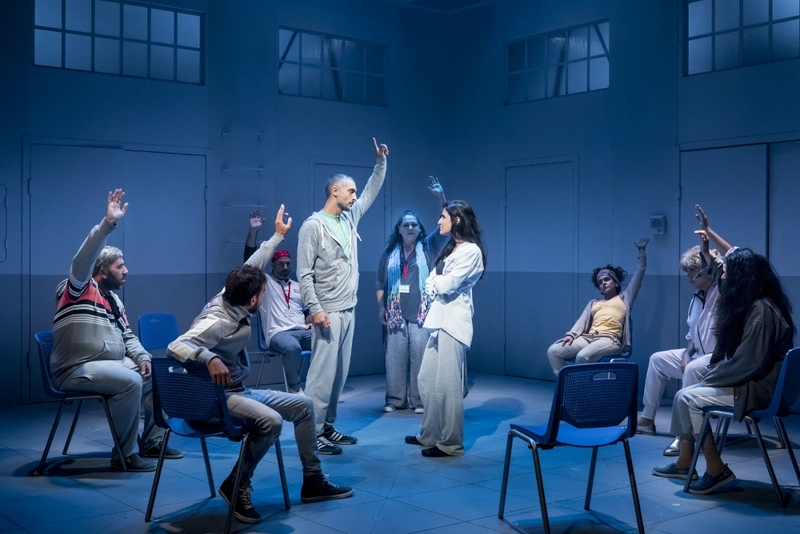 Ultimately, the play asks a very terrifying “what if” – what if these triggers, at least some of them, are woven into the essential fabric of our identity? Where does that leave Nina/Emma/Sarah/Lucy? Translated by Ido Riklin; Director: Roni Pinkovitch; Set Design: Kinnereth Kisch; Costume Design: Orna Smorgonsky; Music Editing and Movement: Miri Lazar; Lighting Design: Keren Granek; Video Art Design: Yoav Cohen; Assistant Director: Asaf Friedman; Cast: Meggie Azarzer, Florence Bloch, Liron Ben Sasson, Nimrod Bergman, Odel Hayon, Yoram Toledano, Hai Maor, Lior Michaeli, Maayan Amrani, Naama Shapira, May Azulay, Hagar Meshulam Weitzman, Yarden Nikfahama, Renana Nitay, Tal Zirin.